Women’s champion Thilijana Parakramasinghe receiving her award. M. H. Rashen Dilshan of Lions Swimming Club, Ambalangoda and Thilijana Parakramasinghe of Sirimavo Bandaranike Vidyalaya, Colombo won the men’s and women’s titles respectively in the annual 10km Sea Swim conducted by the Kinross Swimming & Life Saving Club of Wellawatte recently. This is the 54th edition of the annual sea swim which is known to be the longest sea swim event of the country. The event has a long history and became one of the most anticipated annual events of the Sri Lankan swimming championship calendar. Rashen took 2h:29m.20s to win the open men’s event while school swimming prodigy Thilijana clocked 3h:09m.49s to bag the women’s open title. The competition commenced from the seas near Kinross club and proceeded through to Mt Lavinia and returned to the starting point. W. Wimal Kumara (2h:30m.26s) of SL Army and W. M. V. L. Abeyratne (2h:31m.53s) who is also from the Army won the open men’s second and third places. In the women’s competition, Thilijana clinched the victory convincingly beating many experienced and senior swimmers. She displayed a superb performance and none of the other swimmers were able to pose a challenge to her. The second-placed D. Hiruni Maheshika of Lions Swimming Club, Ambalangoda reached the finish line way behind to Thilijana clocking 3h:22m.57s. R. K. Jayathilaka of SL Army won the women’s third place with a timing of 3h:26m.24s. 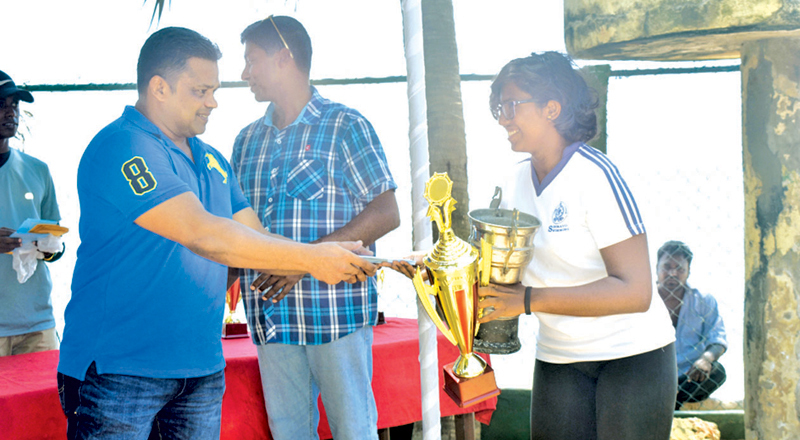 Meanwhile, the SL Army won the team championship scoring 189 points while Lions Swimming Club, Ambalangoda (108 points) and Police Swimming Club (90 points) became second and third respectively in the team event. 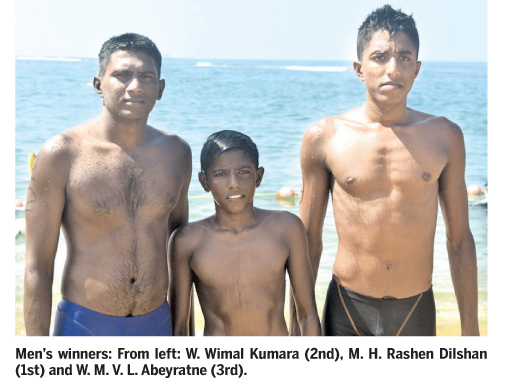 Oshadha Prathibha of Lions Swimming Club, Ambalangoda was the youngest male swimmer while his club-mate D. Hiruni Maheshika was the youngest female contestant at this year’s event. C. I. S. Edirisinghe of Kinross Swimming & Life Saving Club was the oldest to compete this year.